The first distillation takes place in a 'wash' still where the alcohol in the wash is separated by heating - because alcohol boils at a lower temperature than water (78.37°C/165°F versus 100°C/212°F) so the spirit vaporises before the water and rises up the neck of the still until the spirit vapour reaches the top and is directed through the swan neck, along the lyne-arm to the condenser. However, a few (including Glenfarclas, Glenfiddich, Macallan and Springbank) continue to use the gas fuelled direct fire method. This direct form of heating can cause hot spots that burn the wash. This promotes maillard reactions that produce furfural and sulphur compounds, especially thiophenes and polysulphides, which can add complexity and attractive roasted notes to the spirit. From the swan neck the vapour is directed through the lyne arm to a condenser where continuously running cold water is used to condense the vapour back into a liquid. 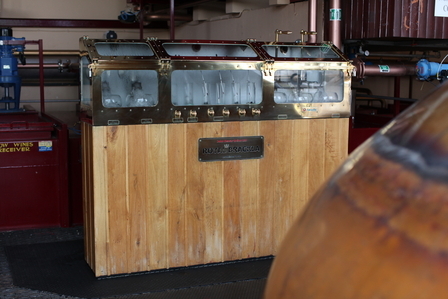 It is usual for wash stills to have a pair of small glass windows or 'sight glasses' in the neck allowing the distiller to watch for what is known as 'boil-over' or 'carry-over'. If a wash still is charged with a wash produced by a short fermentation, then it is likely to be more prone to froth and boil-over as it is more lively. 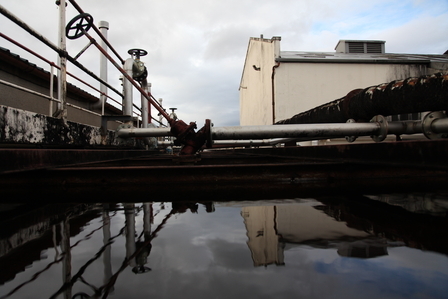 Like heating a pan of milk, the wash is prone to frothing as it boils and the rising foam contains solids which are detrimental to the distillate if allowed to enter the condenser. Even a small amount of boil-over will give a nutty character to the distillate. Hence, as with heating milk, the distiller can reduce the heat by lowering steam pressure so controlling the boil and holding the head between the two sight glasses, thus ensuring the solids are retained in the still. As distillation progresses the risk of boil-over reduces when the still 'breaks' and frothing subsides, allowing the steam pressure and so the heat to be turned up. 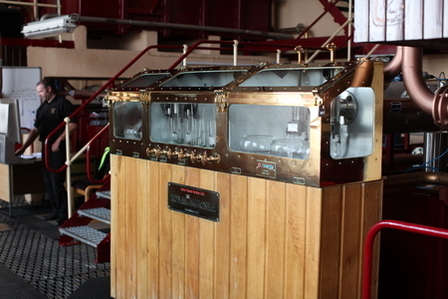 This first distillation, lasting four to six hours, strips alcohol from the solids in the wash and some of its water to produce a liquid known as 'low wines', with an increased alcohol content of about 21% to 30% alc./vol. (from the original 7% to 8% alc./vol wash). 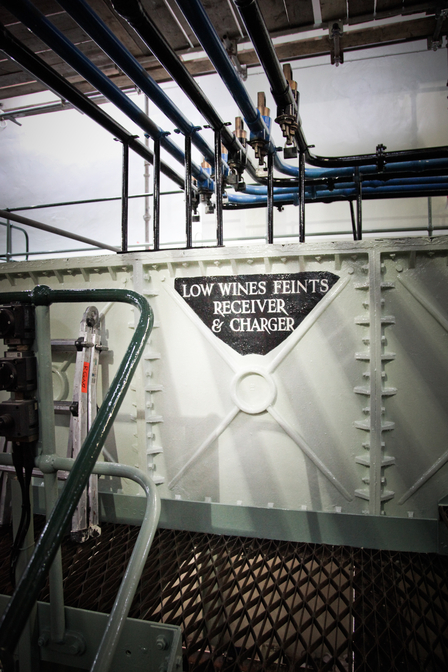 However, these low wines contain unwanted compounds so require distilling again in a second still, which some distillers call a 'low-wines still' and others a 'spirit still'. 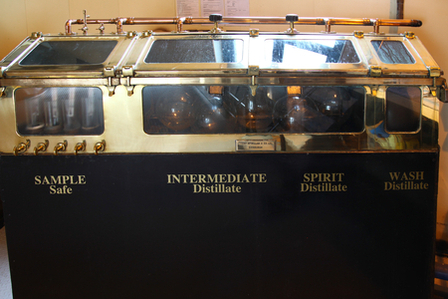 During second distillation the same principles apply as in the first distillation but with more of the water being left behind as the alcohol vaporises up the still, but as there are no solids in the still to start as these have already been removed by the first distillation, frothing is not an issue, so spirit stills don't have sight glasses in their necks. In the second distillation, and sometimes also a third distillation (in the case of Auchentoshan and Hazelburn), the distiller exercises considerable control over the character of the final distillate. The distiller's art is knowing when to 'make the cut'. Different flavouring agents evaporate at different temperatures, and the distiller has to find the right balance. 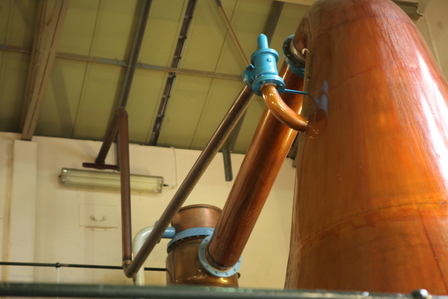 Spirit stills typically run for about six hours with the batch of distillate produced by second distillation generally having a strength of around 70% alc./vol.. In the rare case a third distillation is used then the new make spirit produced can be over 80% alc./vol.. The most volatile compounds with the lowest boiling points (such as methanol, acetaldehyde, some ethyl esters and volatile sulphur compounds) vaporise first to emerge via the condenser in the spirit safe as what's known as foreshots (or heads). This first flow of liquid through the lyne-arm and condenser will also pick up deposits remaining from the previous distillation. These foreshots are not desirable as they either have an unpleasant flavour, are dangerous to health, or both, so are directed to a holding tank known as a Feints Receiver. 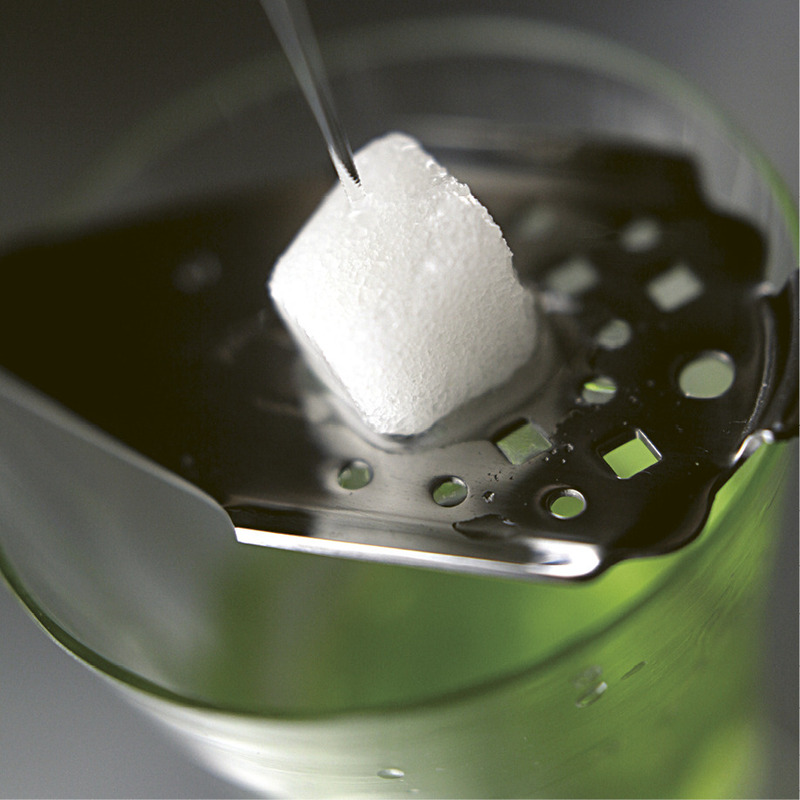 After the heads, the desirable ethanol alcohol 'spirit run' (also known as 'hearts', 'new make' or 'clearic') starts to flow. Once aged, it is this distillate that will become whisky. 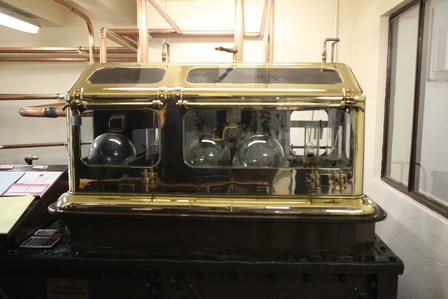 Valves in the spirit safe allow the distiller to direct the spirit run to another tank, known as an Intermediate Spirit Receiver (I.S.R.). Lastly, the heavy, oily least volatile compounds emerge as what's known as feints (or tails). Like the foreshots, to a lesser or greater degree, these are not desirable so valves in the sprit safe are used to direct these to the Feints Receiver to be stored along with heads. The art of the distiller lies in the speed he/she runs the still at (controlled by adjusting gas the pressure) and most crucially when he/she cuts the run from foreshots to hearts and from hearts to feints. The wash is composed of numerous different compounds, each with a different boiling point. The most volatile, those with a low boiling point will form part of the composition of the foreshots, while those with a high boiling point will emerge as part of the feints. 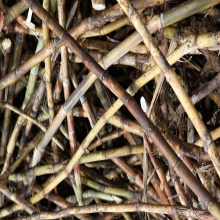 While it is true to say that the aim of the distiller is to separate the ethanol alcohol (heart) from the foreshots and feints, a small proportion of some of the compounds in the foreshots and feints can contribute desirable flavours to the finished whisky. These are known as congeners and the distiller's art is to make cuts in the run of distillate at points that will allow these desirable congeners from the foreshots and feints to flow into I.S.R. with the heart, rather than being discarded. Consequently, if the distiller wants to make a light whisky, then the cuts will be made earlier and conversely a weightier whisky will have later cut points allowing the heart to run a little longer towards the feints. This is particularly the case for peaty whiskies as feints are usually rich in the phenols that carry smoky aromas. Foreshots typically start to come over at 74-75% alc./vol. 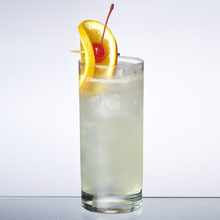 with the cut made to hearts typically at 71 to 72% and the cut made to feints at 65 to 62% alc./vol. but this varies greatly between distillers. 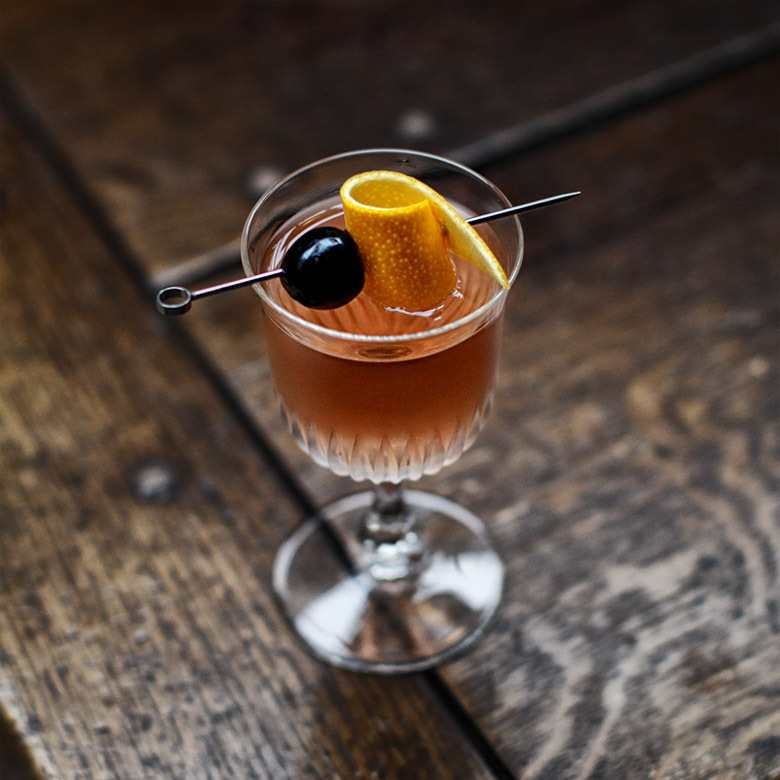 Traditional distilleries use thermometers and hydrometers, while more modern distilleries have a host of electronic monitoring devices to help them know when to make cuts. However, experienced distillers tend to rely most on their nose and experience. It's worth noting that in the rare case a third distillation is used in whisky production, then more of the congeners will be removed and the spirit will be lighter in style. Typically, the still is run until the feints are 1% alc./vol. at which point it is uneconomical to continue distillation. The alcoholic liquid left in the still is termed 'pot ale' and this is discarded, often being sprayed over local fields. The foreshots and feints are returned for re-distillation with the next batch of low wines. I.e. 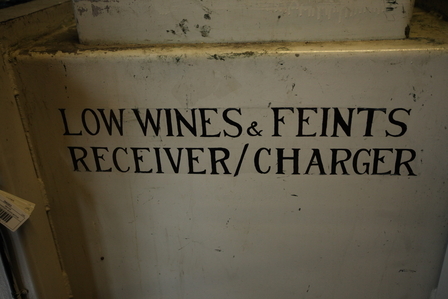 the low wines and feints are returned to the start of the next second distillation. Distillation is not just process of separation, heat, copper contact and the interaction between compounds during distillation alters some of these flavour compounds and promotes the production of others. Some new make spirits have a desirable waxiness which seems to be amplified, if not created in the I.S.R.. 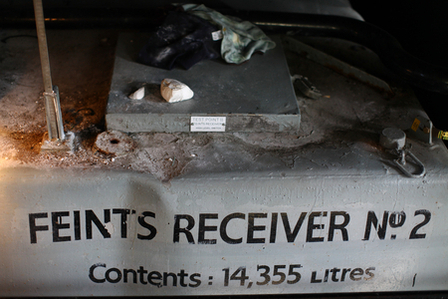 Hence, in distilleries where this waxiness is key to the character of the single malt whisky produced these holding tanks tend not to be either fully emptied or cleaned to save the risk of losing distinctive waxy notes from future distillations. 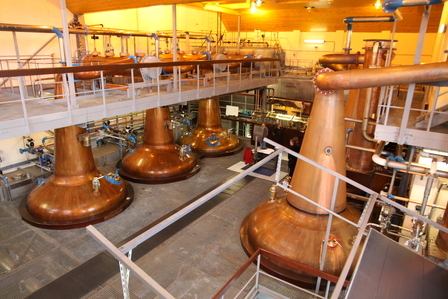 Scotch malt whisky distilleries are typically built with pairs of wash and spirit stills, usually designed so the capacity of the spirit still is in proportion to the output of the wash still. This is often as simple as the output of one wash still perfectly filling one spirit still, but it could equally be one large wash still filling two small spirit stills, or the output of two wash stills charging one spirit still. All the above combinations are termed 'balanced'. 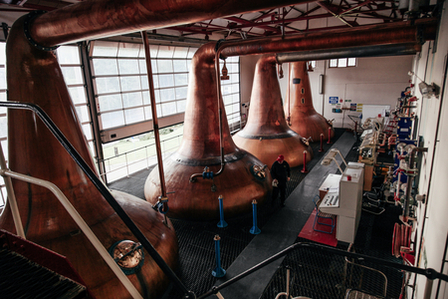 In contrast, unbalanced wash and spirit stills can mean weeks of distilling before a balanced cycle is achieved. I.e. 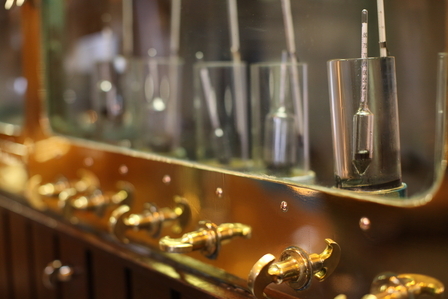 the output of a number of wash distillations perfectly fill a number of spirit distillations. 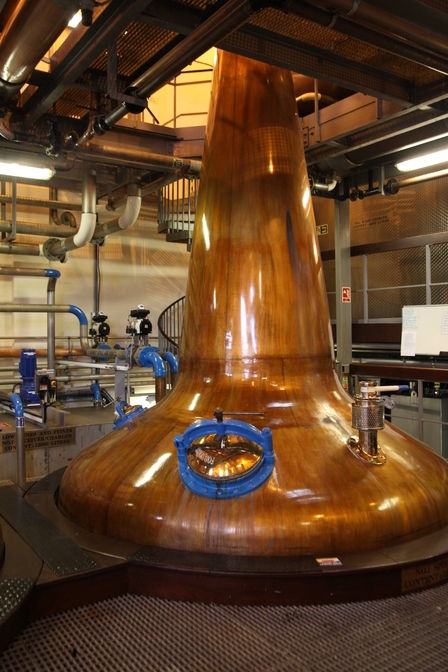 Incidentally, in most Scotch whisky distilleries the wash stills are easily distinguished by their fittings being painted red while those on the spirits stills are painted blue. 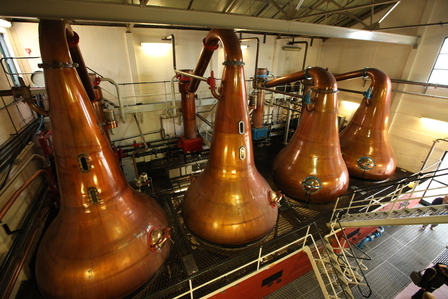 Copper is used to make whisky pot stills partly due to it being easy to work but mostly due its reacting beneficially with the vapours produced during distillation. 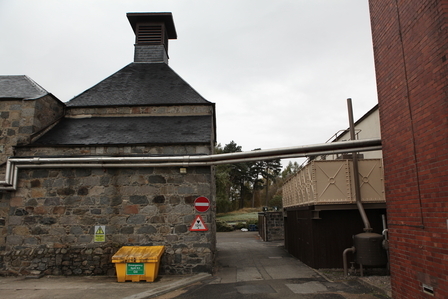 Alcohol produced by fermenting malted barley contains natural sulphur compounds that if allowed in the final whisky in too large a concentration will impair flavour. Copper reacts with the sulphur in the alcohol vapour produced during distillation to form harmless copper sulphate which can easily be removed by filtration (this is the green substance often seen forming in spirit safes). 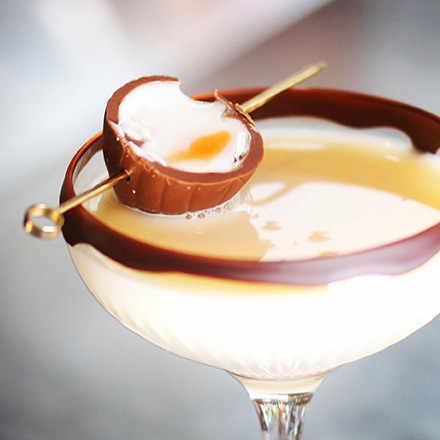 The more contact the alcohol vapour has with copper so the lighter the spirit will be. 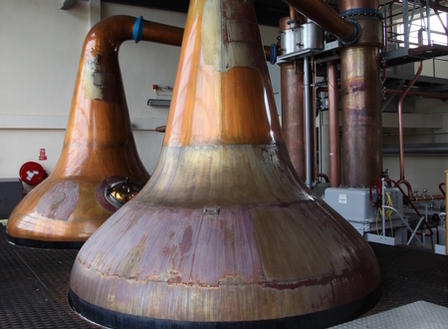 Hence, the size, shape and design of the pot still will have a considerable effect on the character of the spirit produced. As will the type of condenser used to cool the vapour to spirit. 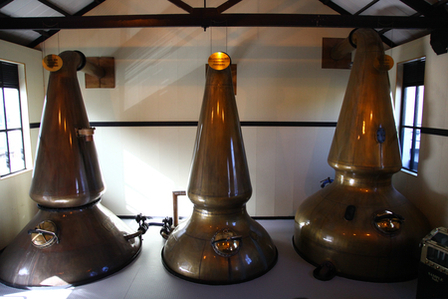 Pot stills have three typical shapes: plain neck, boil ball and lamp-glass. Boil balls are most commonly used on wash stills and tend to add a pine note to the spirit. Lamp-glass necks resemble the shape of hurricane lamps. The nip at their waist increases reflux, a term used when rising spirit vapours hit the nipped cooler sides of the neck, condense and run down the copper back into the kettle to vaporise again. This increases copper contact but more importantly reflux increases the rectifying effect of the still, so producing a lighter spirit. The more the reflux, the lighter the spirit will be. The height of the still will also dramatically affect the character of the spirit produced. 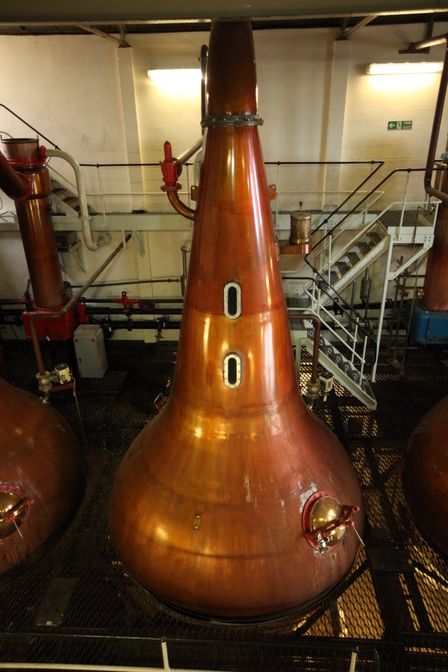 Tall stills have a larger copper surface area and also make it harder for the vapour to rise so promoting reflux. 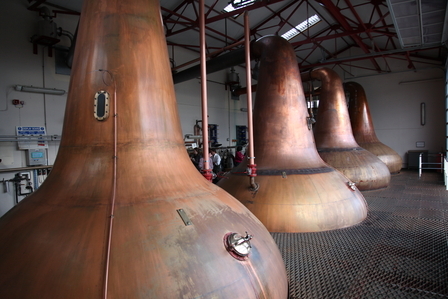 Tall stills tend to produce light spirits, and conversely, shorter stills typically produce heavier and richer spirits. The lyne-arm can be intersected with a purifier, a device, either cooled or uncooled, which condenses some of the heavier vapours from the lyne arm and returns them back to the still (reflux) via a pipe. Cooled purifiers are chilled by continuously flowing water to increase levels of condensation and so reflux. 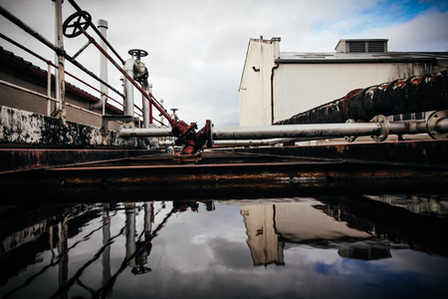 Uncooled purifiers are in operation at Ardbeg, Glenlossie, Glen Spey, Stathmill, Talisker and Tormore, while Glen Grant is the only distillery to use purifiers on both it's wash and spirit stills. There are two types of condensers: 'shell-and-tube' condensers and traditional 'worm-tub' condensers - both having very descriptive names. Worm-tubs usually sit on the outside wall of the still house with the lyne-arm from the still passing through the wall and into the worm tub - a large open topped vat (usually rectangular and of steel construction) filled with water which is kept cold by fresh water continually pumped into the bottom of the 'tub' with warmer water overflowing out from near the top. The lyne-arm is extended inside the worm-tub with more copper tubing (some 10 to 15 meters / 30 to 50 feet long), its wide bore gradually reducing in girth as it coils around (worm-like) inside the worm-tub to eventually emerge as a thin copper tube from which the condensed distillate flows to the spirit safe. (The worm-like coil of copper tube within a condenser is more correctly termed a serpent.) 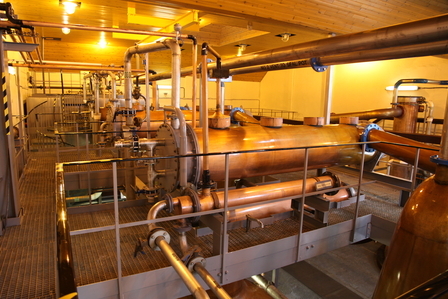 The rate at which cold water flows into the worm-tub affects whether the vat runs hot or cold, moderating the flow allows the distiller to run the condenser at similar temperatures during summer and winter. Shell-and-tube condensers comprise dozens of copper tubes (around 100) surrounded by continuously flowing cold water within a large diameter pipe. 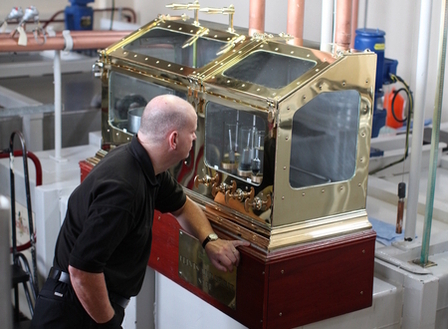 As the vapour passes through the condenser's tubes it is cooled by the surrounding water - the direct opposite to what happens within the boiler of a steam engine. 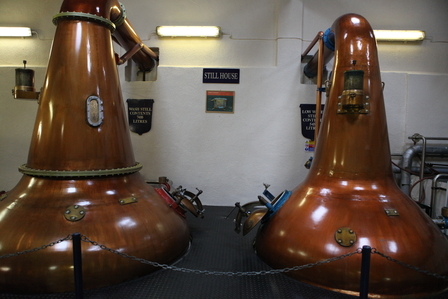 Shell-and-tube condensers usually stand vertically (about 2.5 meters/8 feet tall), but in some distilleries (such as Dalmore and Macduff) they lie horizontally. Shell-and-tub condensers usually sit adjacent to the still they are attached to inside the still-house but sometimes they lie outside. Condensers housed within the still-house condense more slowly due to the ambient heat within the still-house, while conversely, those situated outside operate colder and faster so producing a heavier spirit. Despite their appearance, worm-tubs offer less copper contact with the vapour than the 100 or so copper tubes which comprise shell-and-tube condensers, so worm-tub condensers produce heavier more complex spirits with a richer mouthfeel, which tend to suit longer maturation. Some worm-tubs are operated in such a way that they promote meaty flavour reminiscent of roast beef, Bovril and Marmite. 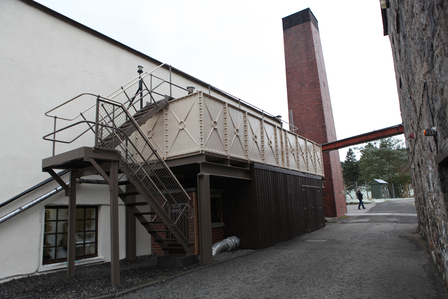 Worm-tubs were invented in Germany circa 1540 and were the only kind of condenser used in Scottish distilleries until the 1880s when the first shell-and-tube condensers started to appear. Invented in 1825 by William Grimble, shell-and-tubes are more efficient but worm-tubs continued to be installed until after the WWII when shell-and-tube condensers became standard issue. 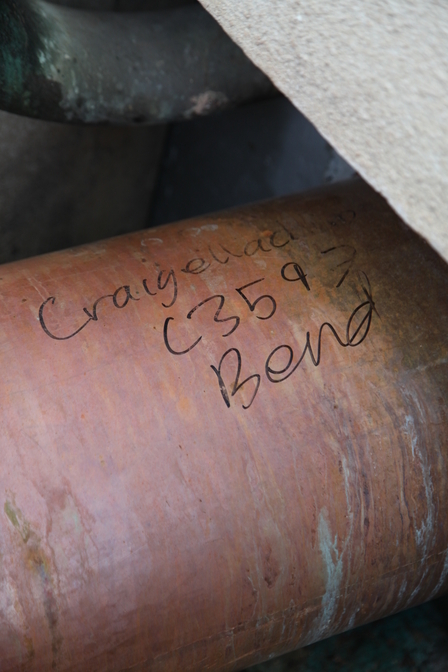 The last new worm-tubs were commissioned in the mid-1960s and only 15 Scottish distilleries continue to operate worm-tub condensers: Balmenach, Benrinnes, Cragganmore, Craigellachie, Dalwhinnie, Edradour, Glen Elgin, Glenkinchie, Mortlach, Oban, Pulteney, Speyburn, Springbank (on the wash still only), Talisker and Royal Lochnagar. 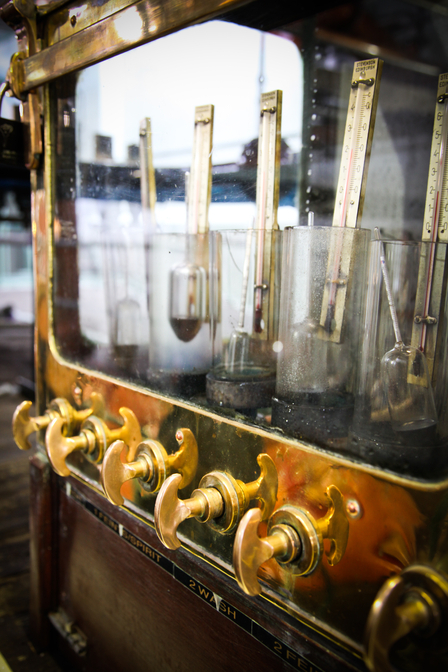 Depending on how the distiller regulates the heat, the distillation can be slowed or speeded up. 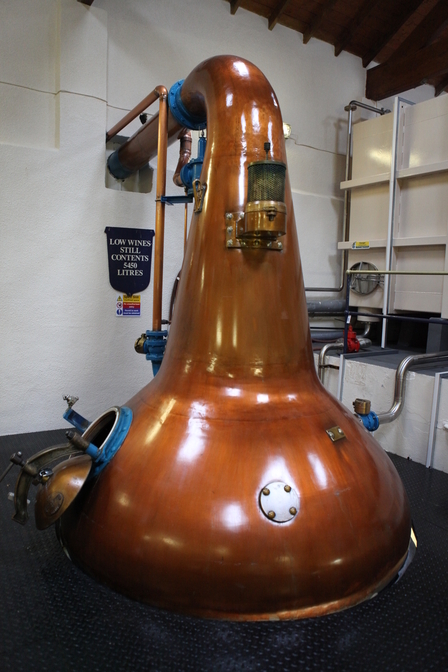 The slower the still is run so the longer the distillation takes - so prolonging exposure to copper. Hence, the slower the distillation the lighter the spirit produced. 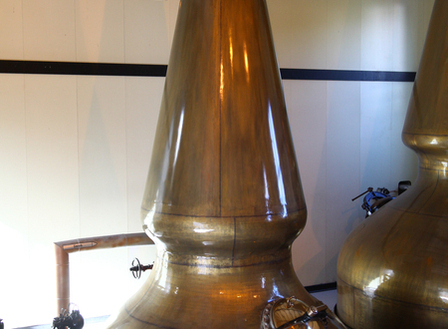 Pot stills are very inefficient compared to more modern continuous stills (which are not permitted for Scotch malt whisky production), but they have the advantage of retaining much of the flavour of the malt. 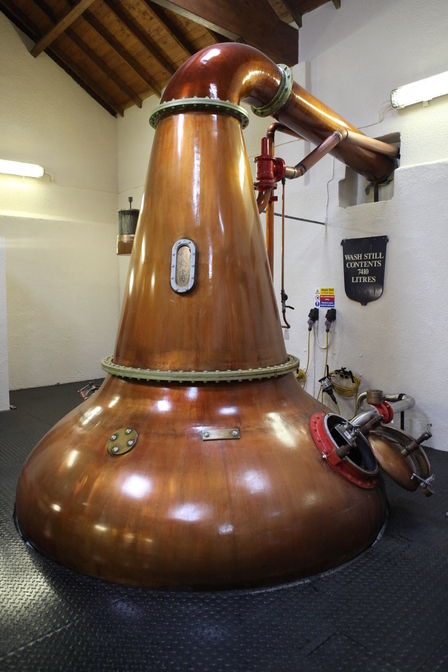 The spirit from a malt whisky pot still (new make spirit), leaves the still at an average of around 70% alc./vol. compared to Scotch grain whisky which is made in continuous stills and is typically 95% alc./vol.. Malt whisky has 260 to 490 ppm congeners, while grain whisky typically has 150 to 300 ppm congeners.